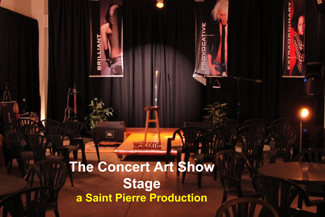 "A Grand Expression Of Music, Art & TV"
The Concert Art Shows are produced by Saint Pierre in the New Art City, Ventura. The stage is pictured above. "Every Concert Is An Art Show". Celebrating the cultural arts for over four years. Thank you to all our fans. "Best Venue Ventura".